Sunday I finished two blocks Cozy Quilt Shop's design Cozy Waves (3rd row down in center column) and Bits and Pieces's design Perfect Patriotic Peony (last row in 1st column). Just two more to go now. I have been giving more thought to how I will set the blocks together. 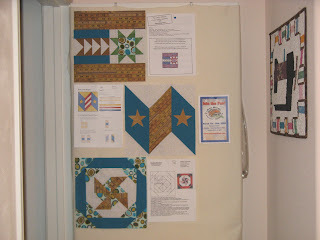 Right now I am thinking of doing something with pinwheels or perhaps with flying geese instead of the Twist and Turn. Time for discussion with quilting friends. Check out other Design Walls at Patchwork Times. Today I have no fabric to report as used. I'm still working on my last UFO for this year. 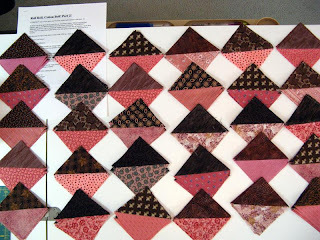 I've got eight blocks done with the next one cut and ready to sew. This block design is from Cozy Quilt Shop called Cozy Waves. 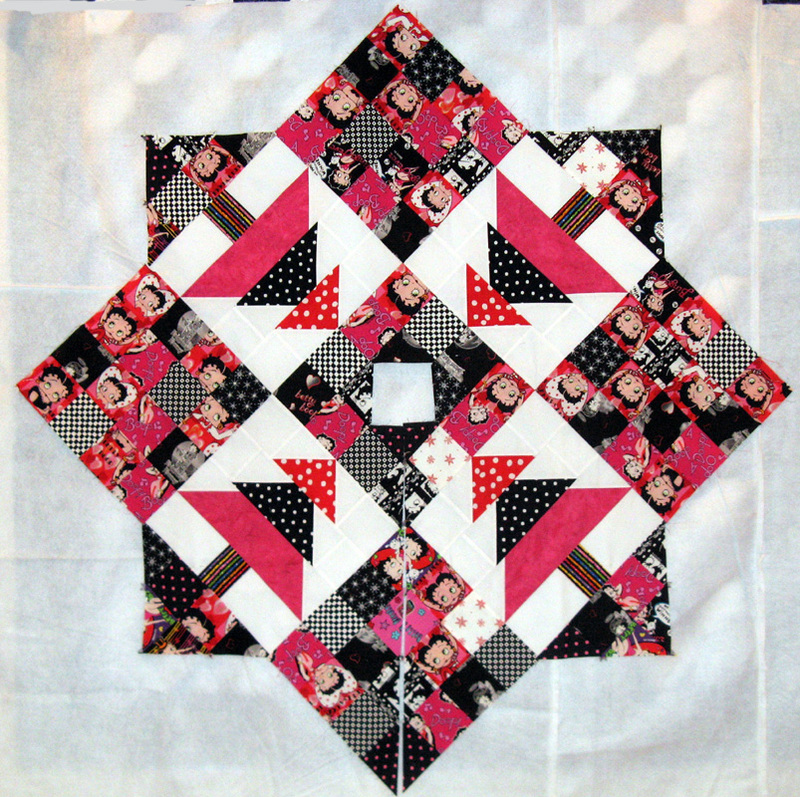 Block designs yet to sew are from Bits & Pieces called Perfect Patriotic Peony, Rosie's Calico Cupboard Quilt Shop called Patriotic Heart Block, and Fat Quarters Quilt Shop called Union Square. All of the designs finish at 12". 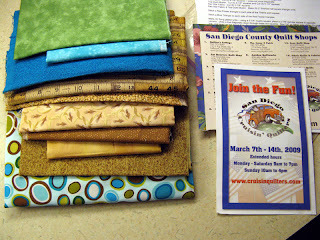 This week I did get 1 yard of fabric (light blue) to complete 2009 Kruisin Kwilt, too bad since I wanted to only use my stash. I kept strong at Amidon's Quilt Shop as I only left with the one piece. I'm cutting the timeline pretty close on this one! I worked this week on the binding and labels for Koala, Adel's Betty Boop Christmas Tree Skirt, and Kreepy. All three of these are done. I'll be giving Adel her gift tomorrow. Hopefully I'll be able to catch her with a big smile. I continued with Bonnie Hunter's 2010 Mystery Roll, Roll, Cotton Boll Clue #2 AND decided to work on one of her earlier released Mystery Old Tobacco Road. I'm going to go clue for clue on these two projects. Someone else mentioned they were going to do it and I liked the idea so I'm going for it too. I'm right now in the middle of Clue #2 on this one. 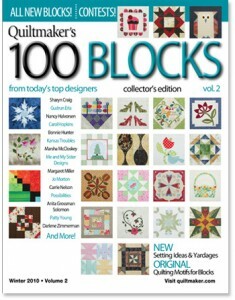 Yesterday I got my Quiltmaker 100 Block Designs magazine that I won during the Blog Tour. There is something I'm sure to make from all the wonderful designs that are in this publication. 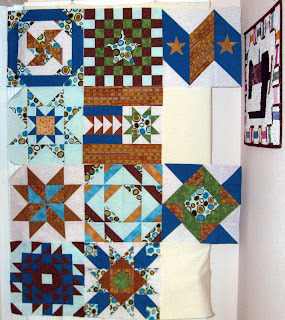 Go to Judy's blog at Patchwork Times and see other Sunday Stash Reports. Six blocks done towards my last UFO for this year...times getting tight...six more to do before November 30th. I've got to make a run to the quilt shop :(! Unhappy with this because I wanted to use only stash, but I need a light blue background for the remaining blocks. It's just NOT in my stash and it's the only thing that I think will work. I just need a little bit...hope I can get in and out without anything else drawing my attention. Here's the six blocks I've got made right now. The next six blocks will have the light blue background and instead of the teal blue will use a dark brown. Not sure what other changes of fabrics will take place; there is a short stash stack to choose from :)! Check back on Sunday for further results; maybe even a finish since I have four days off and NO plans to attend any crazy hour shopping sprees. Here's what's on my design wall today as we start our week. This is the first three of 12 blocks that will be this quilt project. All from my stash, yippee! There are a total of 12 star themed blocks designs for the top. There will be six blocks using the yard stick novelty fabric with this white with blue and green boomerang design background and six blocks using a chocolate brown with a light blue background. You know how stash quilts work--improvise with what you've got! 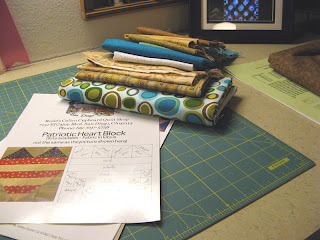 I'll have enough of the yard stick novelty fabric to add a twist and turn to the chocolate brown/light blue blocks and enough of the chocolate brown to add a twist and turn to the yard stick blocks--well I'm hoping to have enough. If not there will be more improvising. I'm through Clue #1 with Kotton. It was decided that both Kerry and I will make the full quilt project instead of splitting one. We love the way the fabrics are going together and it will help reduce our stash to make them bigger. Waiting for Clue #2's release on Friday. Clue #1 went together fast. Clue #2 may not be quite as fast, but then maybe Bonnie will give us a break since we did so much work in the kitchen for our Thanksgiving Holiday meal. Take time to check out other Design Walls at Patchwork Times (just select the button on the right. Have a happy Thanksgiving Holiday. Here we are at the start of a fresh new week, the last full week of November. The big Thanksgiving Holiday just a few days away from today. Do you have anyone traveling who is concerned about the new TSA boarding policy? Frankly, I'd prefer to be safe if unfortunately this is what it must take thanks to the few who continue to make it so for us. There's always a car, bus train, or boat right? All this transportation stuff aside, I hope that you have a nice Thanksgiving Holiday. Further communication with Quiltmaker has me busy having appraised both Koh-i-noor and Kiwiberry. I have an appointment with Julia Zgliniec a little later this morning. Julia is a certified AQS Appraiser that I've used a few times before for appraisals. She's located not far from my home which makes it convenient. I'll be shipping this week in hopes that the quilts will reach their destination by Wednesday. Saturday all Roll, Roll, Cotton Boll fabrics in hand I headed over to Kerry's for a day of sewing. On tap for today until finished Clue #1. Kerry had the long arm humming while she sewed the 2" strips of pink/green/pink together. I'd take take it from her to the ironing table and then to the cutting table where they'd be cut a second time into 2" segments. 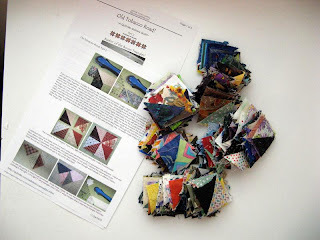 Somewhere along the process it occurred to us that we just loved what we saw with the combination of color and the quantity of fabrics we had available to make two full quilts instead of splitting one. We made an additional 172 segments then split the entire 344 equaling out the variety of fabric combinations proportionally. Now we will have to find another red constant since we'd only planned for one quilt. We both are going to start pulling potential fabrics for 10 1/2" squares for the back. This might be a challenge as we've depleted most of the color groups used in this quilt for earlier projects...stash it needs to be! Did I mention that I've already named my project Kotton? Bring on Clue #2. I'll spend the day today on binding. I've got Kreepy, Adel's Betty Boop Tree Skirt, and Koala all ready for needle and thread and of course Kaos and maybe even Koko will nap awhile. It's still rather damp and chilly with rain being called for still through Tuesday. No stash to report as used and nothing to report as purchased either. Next week I'll claim a use with my UFO 2009 Kruisin Kwilt that's certain to be finished just in the nick of time. I've had an exciting quilty week so far...if something else happens today I'm going to rush out to buy a California Lottery Ticket. 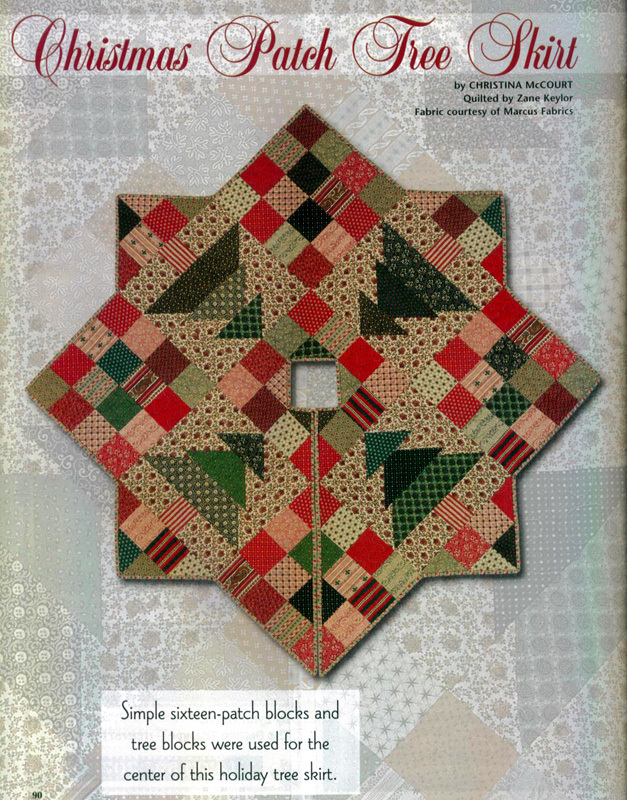 My first surprise was on Monday when I learned that I'd won the Quiltmaker's 100 Blocks Volume 2 publication from the week long blog tour hosted by Quiltmaker to introduce their publication. Imagine my delight when I saw on the winner's list "#5 Sandi" listed on the Winners from the 100 Blocks Vol. 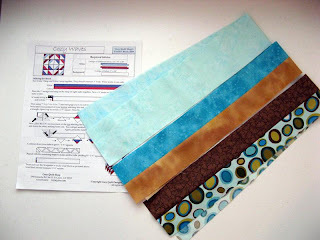 2 blog tour for a comment I made on the Quiltmaker 2011: A Sneak Peek give away. Check out my blog entry on Tuesday, November 9 for more information on the tour and a picture of the cover of what I will soon have coming to me from Quiltmaker. My second surprise was on Tuesday when I learned that Eileen Fowler, Associate Editor in charge of Spotlight for Quiltmaker requested I send them two of my quilts. Koh-i-noor and Kiwiberry are being considered for Spotlight which is one of the regular departments in each issue (it's on the last page of each publication). Both of these quilts were made in 2009 and both happen to be Bonnie Hunter designs e.g. Blue Ridge Beauty and Strip Twist respectively that were published as a pattern in Quiltmaker in 2008 and 2009. I've contacted an AQS appraiser to establish their value and hope to have them in the mail to Quiltmaker real soon. 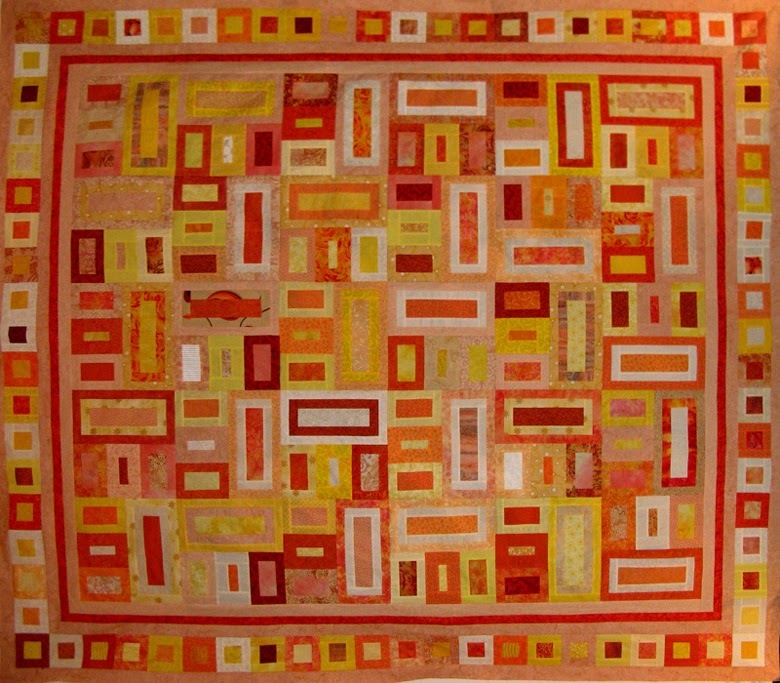 I'm so excited to be considered by Quiltmaker again! Monday night was my Canyon Quilt Guild's Holiday Meeting. The potluck offered all kinds of tasty delights for all of us. Salads seem to be the popular dish nowadays which meets with my approval 100%. The challenge of aprons was outstanding...some very clever garments that took prizes for the best of about nine different categories that included sexiest, gardening, recycled, and several more. Tuesday night I spent time hand sewing the binding down on Krumbs and preparing Koala for sewing down the binding and sleeve. Both of these quilts happen to be Bonnie Hunter designs Fun with Bricks and My Blue Heaven. I've got fabrics selected for my last 2010 UFO; it's a start although not as fast as it needs to be considering my deadline of November 30th! Here's a photo of the fabrics I'll work with to make the 15 different star blocks that will become this quilt. The anticipation of the release of Clue #1 for Bonnie Hunter's Mystery being referred to as RRCB (short for Roll, Roll, Cotton Boll) that is scheduled for Friday is crazy for all the Bonnie-ites! Hope your week is going as well as mine has so far. Happy Sewing. The week that Bonnie Hunter's latest mystery project "Roll, Roll, Cotton Boll" Clue #1 is to be released is upon us. Can hardly wait to get going on Friday cutting the pieces and sewing the first of eight clues (as I recall) together for another great design. I've been busy getting ready for this having selected all the patterns, how Kerry and I will tackle the project since we'll be splitting the big quilt in to two separate quilts, and finally having my sewing room ready. Now the last thing I think I need is to spin up a bunch of bobbins! I'm ready to rock and roll with Kotton! On my wall today is a surprise Christmas gift for a coworker and friend, Adel. She's crazy about Betty Boop I found out by chance last year and during the 2009 holiday season I found a good scrappy tree skirt that would do just perfect for all the Betty Boop scraps I had left over from a quilt project made for Rita (one of my Sister-In-Laws). Turns out I don't need to tackle the quilting, Kerry has offered to do it for me and I'm ever so happy she did. I give it to her tonight, YIPPEE! If you know Adel make sure you keep this a surprise! 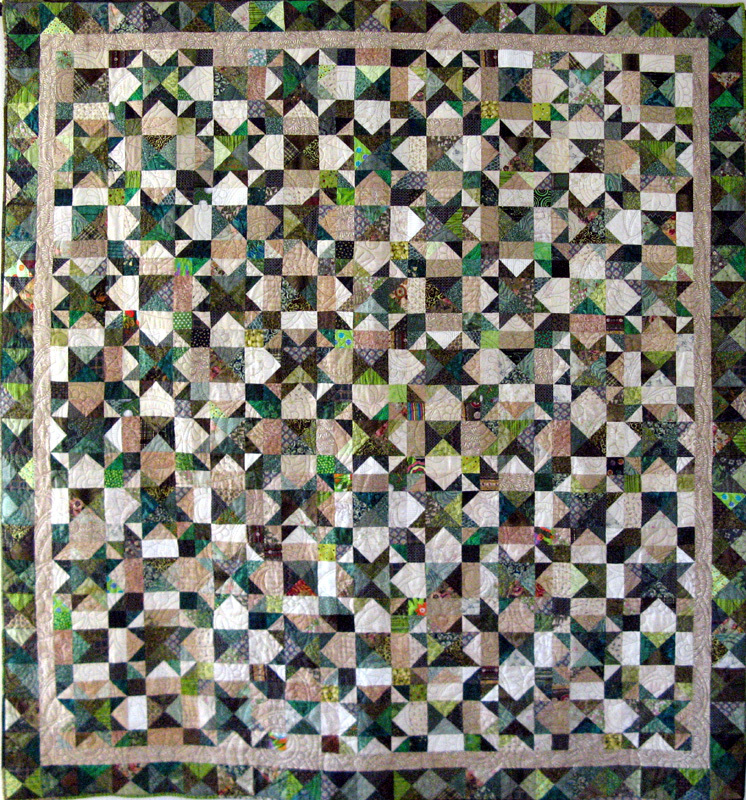 Tonight is Canyon Quilt Guild November Meeting where we have our annual holiday potluck and challenge. This year's challenge is to make an apron. I didn't have time to participate this year but I've done so in previous years and it has been lots of fun. So many unique wild and crazy projects come from these challenges where there's usually three categories to vote for your favorite with prizes. I will be working steady on my last 2010 UFO the rest of the week with a pause on Friday for Clue #1 completion then back to the UFO whose deadline is November 30th EEK! Good morning, it's a beautiful day here in sunny San Diego. We've had some great weather of late, cool and crisp and totally clear. Makes for a beautiful morning walk. I'm waiting on the edge of my seat for Friday to arrive and Clue #1 of Bonnie Hunter's mystery project Roll, Roll, Cotton Boll. 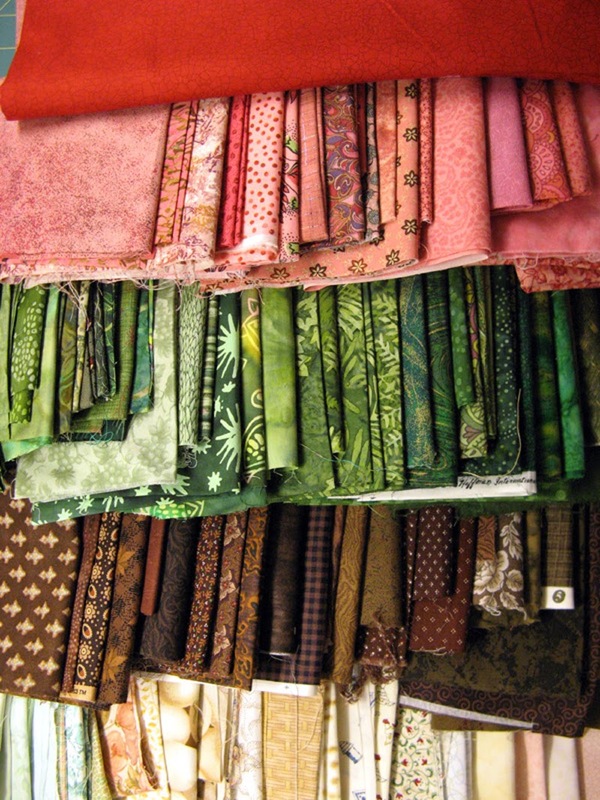 There certainly are a lot of different fabric choices being made by those who plan to sew along. This week I've been spending my sewing hours with binding Krumbs, readying Kandy Korn for Kerry's Quilting, sewing up a surprise Christmas gift for Adel, and NOT working on my last 2010 UFO (2009 Kruisin Kwilt). Instead of working on the UFO that's due the end of November this gift for Adel has gotten my attention most of the time this week. It's a tree skirt from a pattern in the Special Holiday Issue of The Quilter 2009 called Christmas Patch by Christina McCourt. 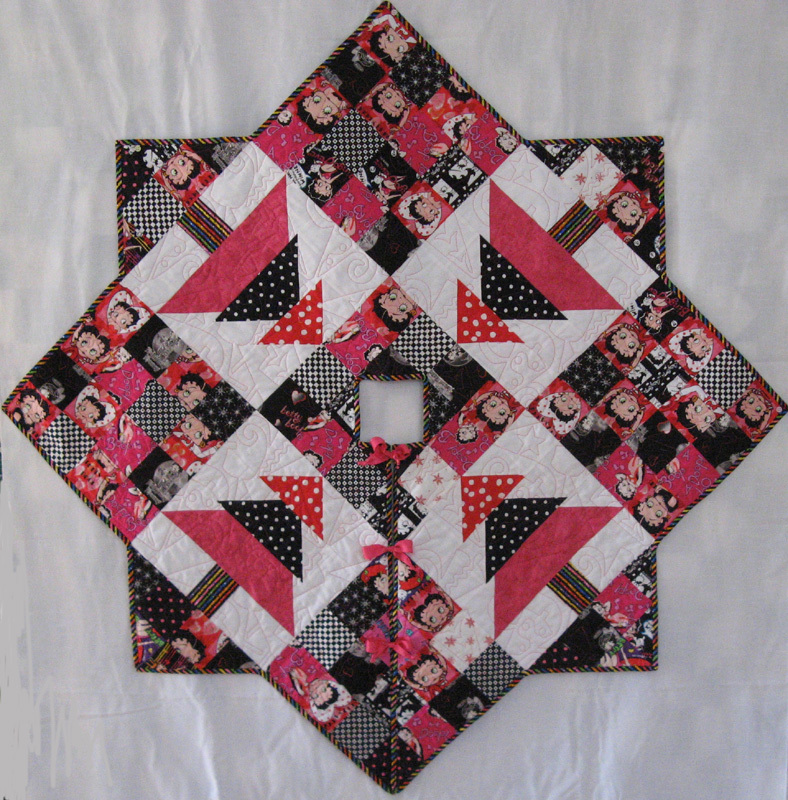 Adel is crazy about Betty Boop, so this one is using scraps (of course) from my stash. Today I'll be quilting it with the hopes of having binding to work on later today. So this is the stash that I'm reporting as used this week. Tomorrow is Canyon Quilt Guild's November meeting. It's our holiday pot luck and challenge meeting for the year since we don't meet in December. I've still been thinking about what to bring. I always like to bring something towards an entree, but homemade which is pretty difficult since I work all day and go directly to the meeting after work. For several years now I've been making something in a crock pot under my desk at work. It's ready by the time I'm enroute to the meeting. Only a couple downsides to this 1) I've got to prepare something that is not too messy to transport and 2) the aroma of what's cooking waifing up from below my desk about half way through the day.... The challenge part of the meeting this year is to make an apron of your design. Judging is by membership for three different categories. I did not participate in this year's challenge--just too much going on right now for me. I'm sure there'll be lots of clever aprons as this is a group of gals with amazing imaginations. I suppose there are lots of reasons to have UFOs, but this one certainly can be said in bold and spelled out in capitals because I'm just not inspired to get it done. Good thing I'm a stickler for getting done what I say I'm going to do! I'll be pulling fabrics from my stash for this one after the tree skirt project is off my sewing surface. Need this UFO started and in full swing yesterday! Got to get ready for Friday's Clue #1! Here's my report for this week. 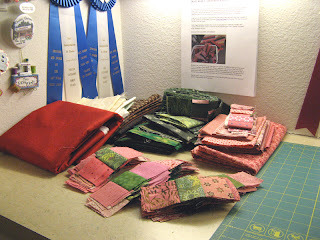 Go to Judy's blog at http://www.patchworktimes.com/ and see other Sunday Stash Reports. Check back tomorrow's Design Wall for a photo of Adel's Betty Boop Tree Skirt! 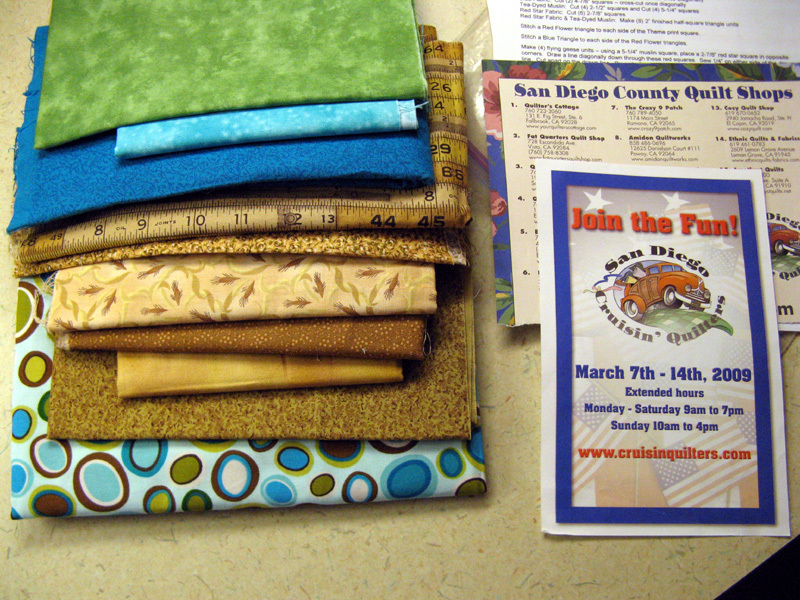 These are the fabrics that Kerry and I have selected for Bonnie Hunter's 2010 Mystery called Roll Roll Cotton Boll. Her fabric selections were shared on November 1 with Clue #1 to be released on November 19. The world of Bonnie-ites is humming on Quiltville Chat with anticipation. 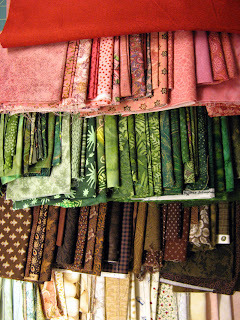 Of course online the Quiltville Chat Yahoo Group has a folder of all the fabrics participants are choosing from their stash (and cover your ears stash users...) or purchases at quilt shops around the globe. There are participants from Canada, Australia, England, Israel and certainly others along with all of us around the United States. Bonnie certainly knows how to shake up a bunch of quilters! I'm still cutting 10 1/2" blocks for the back of Kandy Korn (formerly Kreamed Korn...). All along I was debating on Kandy Korn because the colors of the quilt "felt" more like the popular Halloween candy, but I kept telling myself that Kreamed Korn rolled off the tongue better. Several of you commented that it had more the Kandy Korn ﻿look so I've complied (without too much struggle I might add). I'll be saving "Kreamed" for another time. Maybe it will be right for a shades of brown scrappy quilt I'm going to put together....how's "Kreamed Kappuccino" sound? As I mentioned earlier I'm starting on my last 2010 UFO this week. It's due right around the corner already on the last day of this month. 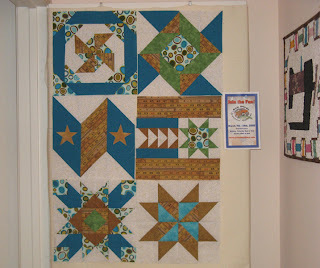 It will be made with the block designs gathered from the 2009 Cruisin Quilt Run that is held annually in March. The designs are all stars and fabrics from my red, white, and blue stash totes will be used. This one is to be called 2009 Kruisin Kwilt...now that was easy! Enjoy the remaining days of this week, hope you get to everything you want to...above all spend time in your sewing room! 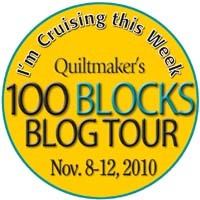 Quiltmaker's 100 Blocks Blog Tour going on now. 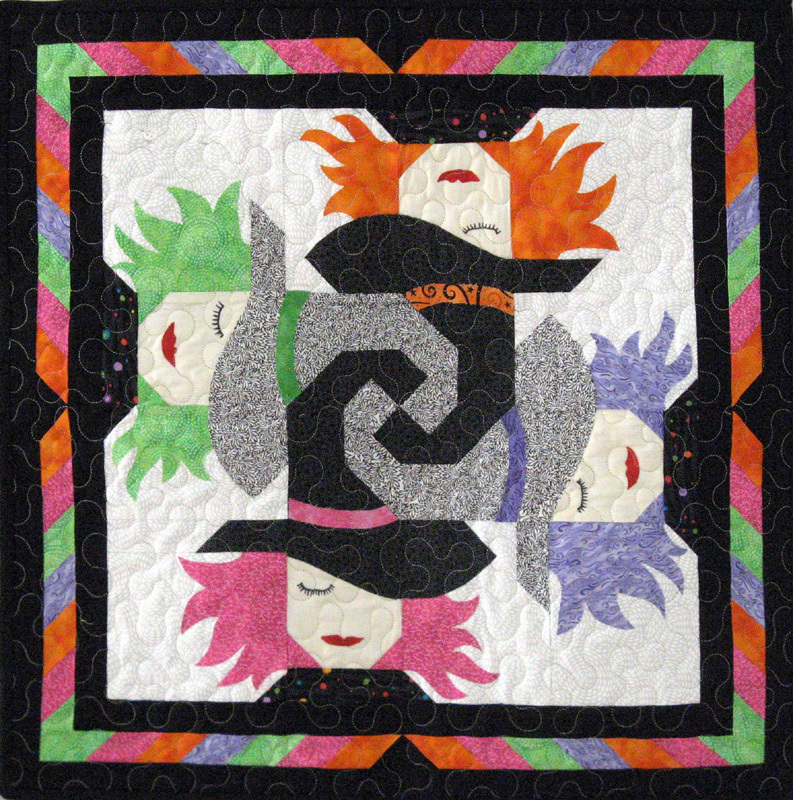 Today is Day 2 with lots of great quilt designer's blogs right at your fingertips. Lot's of great tips and additional give aways when you visit the designer's sites. 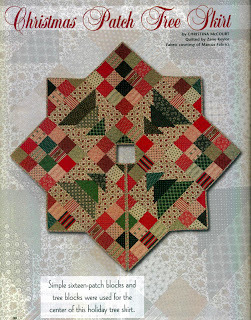 Check them all and be sure to pick up the Quiltmaker publication available on November 16th (that is of course if you don't win one). 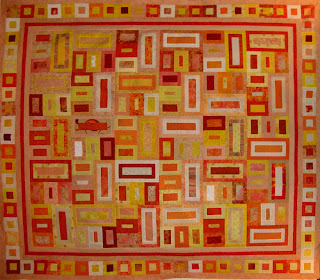 Get in on the fun at www.quiltmaker.com/blogs/quiltypleasures/. Monday again and the second week into this 11th month of 2010. Already the stores are playing holiday music and that big shopping day just after Thanksgiving is nearly upon us. This is a short work week for me and Tuesday is Sunshine Quilt Guild's November Meeting. My Design Wall shows Kreamed Korn complete. Back and batting will be finished this week and be ready for Kerry's Quilting drop off on Saturday. My next project will be my last 2010 UFO challenge for the year. 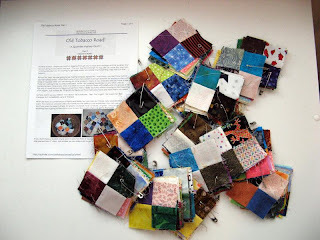 It is a collection of block patterns collected from all the quilt shops that participated during the 2009 Cruisin' Quilters Run that takes place in March. I'll be doing this project in red, white, and blues. I've already coined this one 2009 Kruisin' Kwilt. It's due November 30th. You'll see more of this in the days ahead. See other design walls at http://www.patchworktimes.com/. Have a wonderful week. Really late tonight in submitting my report. There was a reason though! I've been working all day to finish Kreamed Korn. I've just finished putting on the last border for my project which is a smaller one than that of what JudyL's Peaches and Dreams directions called for. I stopped just after the background border that borders the pieced one. Mine finishes at 74" x 86". I'll be assembling the back 10 1/2" (80) squares for the back tomorrow. Kreamed Korn will have a dark binding from all the dark fabrics I have left. I really stirred the bottom of my stash to come up with enough oranges. So I'll be claiming yardage today since this project requires nothing more. Question...when a pattern doesn't call out yardage fabrics as most scrappy designs don't...how do you calculate yardage? Kerry and I decided on a different direction of fabrics than what I first pulled from my stash that will be used for BonnieH's mystery Roll, Roll, Cotton Boll. I interpreted her colors as brights and my quilt buddy Kerry suggested something different. We are going with Bonnie's suggested colors which are a bit toned down than my first pick. I've got very little double pinks to add, but plenty of greens and browns to get us through (along with a good variety of neutrals). This is a joint project so together we selected the red constant fabric yesterday at Rosie's Calico Cupboard Quilt Shop in La Mesa. We'll wait to decide on what to do with the green border that was suggested. I've got my half already named Kotton. (Kerry purchased the red constant fabric so that's why no add to my count!) Waiting now for Clue #1 that's scheduled for release on or about November 19th. Between working on BonnieH's mystery I will be working on my last 2010 UFO that is due on November 30th. This one will be red, white, and blue fabrics and will be called 2009 Kruisin Kwilt. The blocks patterns are what was collected in 2009 during the Cruisin' Quilters Run in March around San Diego. Last I got back Krumbs from Kerry's Quilting yesterday. This quilt design is from BonnieH's website called Fun with Bricks. It's preped for binding and sleeve which I fit in while working on Kreamed Korn. I've yet to sew these pieces to the quilt, but will before Monday Night Football where I plan to do the hand sewing. I've not been very productive this week. I spent Monday evening pulling out fabrics for the new Bonnie Hunter Mystery--had more than I thought of the chocolate browns. 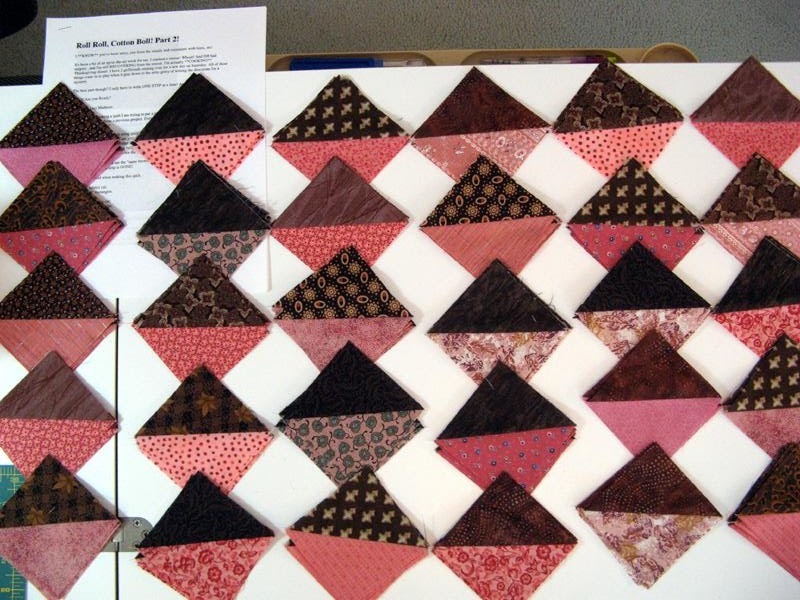 My quilting buddy Kerry and I will be pooling our stashes together for this project. Each of us want a smaller quilt so we'll be splitting the project in half. I've got the lions share of the pinks and probably chocolate browns. We'll combine our stash for the greens and neutrals. Finally, we'll have to figure out what to do with the constant red--sounds like a purchase is inevitable. Tuesday evening was consumed locating and cutting fabrics for the remaining 27 component blocks for the 12" blocks needed for Kreamed Korn. Still not enough--that's when my buddy Sue on Thursday came to the rescue with some of her stash! Wednesday I didn't do anything related to my beloved hobby. I had an unfortunate accident involving the leftover grease from frying up corn tortillas for tacos. Darn if I didn't spill the very hot liquid on my left hand finger tips. Och! Spent most of the night under COLD running water and then hand upright with Noxzema covered fingers enjoying the latest Karate Kid movie (the 2 1/2 hour movie was really good). Today brought the BAE Systems Quilters monthly meeting. This fun group of quilters shares our lunch break exchanging projects and show and tell. I provided Shelly her 2010 Block Exchange Project the Mississippi Wheel of Fortune that I've spoken about on recent posts. Tonight I've ironed with lots of starch the orange scraps Sue brought in for Kreamed Korn. Cut them and finished sewing all 27 component blocks. Ready for tomorrow where at lunchtime Bonnie, Sue and I will have fun laying all the component blocks out into 30 12" squares (each one comprised of one 12" and three 4 1/2" blocks). Let me say that it is a great way to break the day job! Sorry no photos today, but look for something on Sunday.